My teacher, Sonja Larsen, is a master at creating interesting backgrounds for nature prints. In fact, there’s a six-page chapter and a two-page chapter on background techniques in the book Sonja and John Doughty co-authored. The book’s title is Creating Art From Nature. One can paint, spray, drip, & fling watercolor paint onto dampened paper—Sumi-E/Oriental papers, printmaking, or watercolor papers—to create colorful backgrounds. Or, after spreading a watercolor wash onto the printmaking paper (this suggestion does not work well with the softer Oriental papers), place very flattened leaves onto the wash, or for a more geometric background pattern, place crumpled clear food wrap onto the painted, wet paper. Allow the paper to dry before dampening it in preparation for printing. 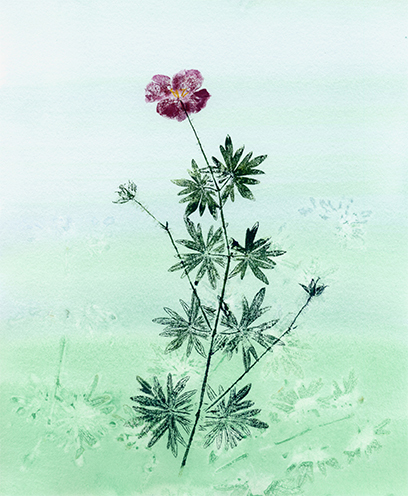 The print below is an example of flattened Cranesbill Geranium (Geraniaceae) leaves displacing the colorful background paint. The leaves created a pattern over which the Cranesbill Geranium plant was then printed.